TurboTax family of products help individuals file their tax returns online. Last year close to 100 million tax returns were filed online and the trend is growing. Filing taxes online using software such as TurboTax allows you to better understand details of tax return, work whenever you want, and receive your refund much faster. One of the reasons for growing assimilation of tax preparation software is the fact that it is simple to use and provides explanation of all the steps you take. And if you are in doubt, right pane of the screen displays the most common questions related to a particular section as well as access to Expert Help. Additionally, the software searches for all potential refunds and tax breaks based on the information entered and assures the highest potential refund and 100% accuracy of calculations. 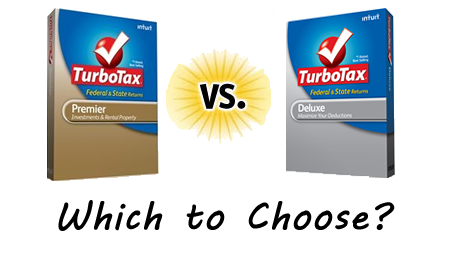 The two most common TurboTax products are TurboTax Deluxe and TurboTax Premier. So which one should you pick? Experienced substantial medical or educational expenses. Derive income from a rental property. Are the beneficiary of an estate or trust. Are an investor in stocks, bonds, mutual funds, or employee stock purchase plans. It is important to mention that besides the characteristics mentioned above, TurboTax Premier includes all the options of TurboTax Deluxe version. What are the basic similarities between the two versions? Smart Check will go over your return before you file it to eliminate any potential mistakes. Accurate calculations – guaranteed; if the IRS spots a computing error caused by TurboTax, any penalties and interests will be covered by TurboTax. Receive the latest Tax Law updates to ensure your return is prepared correctly. Audit support and Audit Defense (for a fee) to represent you in case of an inquiry. Receive help as you progress through your tax return – to your disposition there are: EasyGuide, online answers from tax experts and Live Community members. TurboTax Deluxe and TurboTax Premier facilitate tax preparation by importing your W-2s and 1099s and filling the appropriate areas automatically. If you use the software again the following year, much of your personal information is already there, you just have to verify it or update it if necessary. You can also save your progress at any point and return at more convenient time. With every piece of information you enter, both versions update your current refund or liability. Because they come with a free federal Efile, you can receive your refund in as little as 7 business days if you choose to have it deposited in your checking account electronically or receive a TurboTax Refund Card.